It is possible that you have grown numb to the many ways that the Trump presidential campaign was a money spigot for the very worst kind of people with the very worst kind of political instincts, but please do not look away. 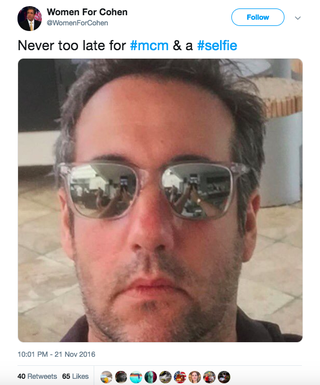 Instead, look toward the Wall Street Journal, which on Thursday reported that Michael Cohen, President Trump’s former lawyer who last month was sentenced to three years in prison for a series of charges related to tax fraud and false statements, apparently paid someone connected to the campaign to create a Twitter account dedicated to calling him hot. John Gauger, who owns a technology company called RedFinch and is also the chief information officer at Liberty University, was reportedly enlisted by Cohen to provide “tech services” to the campaign that included “trying unsuccessfully to manipulate two online polls in Mr. Trump’s favor.” And the creation of @WomenForCohen, of course. Cohen denied this, saying: “All monies paid to Mr. Gauger were by check.” But isn’t he so handsome?